Love potato salad? Here’s a mayo-free alternative for you to try. There are two camps when it comes to enjoying a good potato salad: 1) mayonnaise-based dressing or 2) vinegar based dressing. I’m the second camp and if you are too, here’s the recipe you need to try! I created this recipe out of pure need. To set the scene, it was a Sunday and as I’m in the thick of our routine weekly meal prep and cooking some dishes including basil pesto from our enormous happy basil plant on our balcony garden. I was also making the Fingerling Potato Dill Toss for a potluck later that afternoon feeding lots of friends and family. It’s been a hot summer in Nashville, so anytime I’m contributing to recipes it’s a raw vegetable based like crunchy and refreshing salads (hello Summer Tomato Salad) or chilled dishes like this one. Then it hit me, what if I just made these into 1 recipe? It worked and the odd combo is delicious! Have extra Basil Pesto for other dishes during the week! Carbohydrates: potatoes like other starchy vegetables break down quickly, this causes an increase in blood sugar (i.e. glucose), then insulin increases to take care of all that sugar (i.e. takes the glucose out of our blood and transports it to our liver or muscles for energy or stored as fat if in excess), which can be a cycle for blood sugars going up and down (i.e. crashing an hour after you eat or you’re hungry soon after). To combat this, that’s why it’s an optimal choice to get protein, healthy fats, and fiber alongside to help decrease digestion of the carbohydrates (i.e. sugar) which helps decrease the surge of insulin released and overall slows down the process. Potatoes do contain a good amount of fiber so that does help a bit when it comes to slow and steady digestion of carbohydrates. Potassium powerhouse: potatoes are known for their high amounts of potassium, 1 medium cooked potato contains about 900mg (or 25% DV). 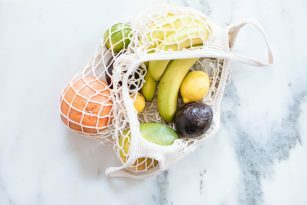 Potassium is an electrolyte our bodies need to keep balanced from a hydration level, nerve pulses and muscle contractions, digestion, heart rhythm, pH balance, and blood pressure. Vitamin B6: B6 is an important vitamin in neurological and overall brain health! Vitamin B6 is involved in creating brain chemicals, including serotonin, dopamine, and norepinephrine. Optimizer Option: keep it balanced by adding in protein to your meal, healthy fat, and tons of fiber from vegetables like a green salad. Also, 1 serving is about 1/2 cup of this salad (or the amount of 4 tiny red potatoes or 1 medium potato chopped). I hope you give this recipe a go at your next family hang, potluck with friends, or just to make a big batch for you and your family this week. I recommend serving it room temperature so the basil warms up a bit and flavors enhance. Also from the macronutrient side of things, try to serve it as a side dish alongside a protein in your meal, some healthy fats (which this basil pesto has a good amount from the olive oil), and fiber from non-starchy vegetables like a big ole’ greens salad! Gently heat on the stove as a sauce for pasta! A delicious and healthy potato salad made with basil pesto instead of traditional mayo-based sauce. First, chop the cleaned potatoes into bite sized chunks. Place in a pot of water covering the potatoes about 2 inches over, boil for 15 minutes or until fork tender. Immediately drain cooked potatoes and rinse with cool water to cool them down. Set aside. In the meantime, for the Basil Pesto, add all ingredients (except the olive oil) in a food <g class=”gr_ gr_246 gr-alert gr_spell gr_inline_cards gr_run_anim ContextualSpelling” id=”246″ data-gr-id=”246″>processor</g> and start to pulse. Then slowly add the olive oil as the food processor or blender is running on low, to combine. Check seasonings and adjust any sea salt or lemon zest at this point. In a large mixing bowl, add about 1/2 cup of the Basil Pesto to the cooked potatoes, toss to combine and coat. You will have extra Basil Pesto leftover, or you can serve it on the side. Add as much Basil Pesto to the salad as you enjoy. Store in an airtight glass container for up to 7 days, serve at room temperature.